Gray iron is the most common cast iron material and is the most frequently utilized cast material. Gray Iron Castings – Imperial Casting Company, Inc.
Gray iron was the original cast iron, although it has recently been replaced in many applications by other iron-carbon alloys with a stronger tensile strength. This material obviously contains iron, but is distinguished from other iron materials by the presence of carbon and silicon. Gray iron is cast much like any other metal; it is poured into a mold and extracted after it cools. 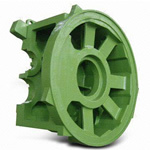 There are several different casting methods through which gray iron is molded, including green sand molding, shell molding, and centrifugal molding. The method by which the gray iron is cast can have varying effects on the mechanical properties of the metal, especially in respect to its cooling rate. Additionally, the composition of the material can also provide different advantages and disadvantages. The presence of graphite makes the material easy to machine and provides great wear resistance. The material is also relatively inexpensive to create which makes the material a common choice for all kinds of engineering applications. Gray iron castings are widely used in the automotive, appliance, agricultural, and machinery industries. Gray iron can be found in pump housings, electrical boxes, engine blocks, and decorative castings. 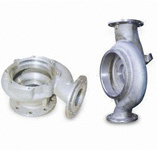 Gray Iron Castings Gray iron castings are created by molding molten gray iron. This particular type of iron contains many small graphite structures, and it actually takes its name from the gray colored fractures that it forms which are caused by the presence of graphite.